What happens when you give a high performance athlete a positive outlet and the skills to channel their drive and determination? A champion is born! Wallace, the 2006 Cynosport World Champion and 2007 Purina Incredible Dog Challenge National Champion for Freestyle Flying Disc, barely made it out of the shelter system. Long days of kenneling, with no training, nearly spelled the end for this super sporty working dog. Thankfully, Andrew (“Roo”) and Clara Yori, recognized his potential and adopted Wallace. With a new loving home that nurtured his natural talents, Wallace began his journey from underdog to superstar. Putting his extraordinary abilities to use, Roo and Wallace began participating in disc dog competitions in 2005 and they’ve been stunning crowds ever since. Competing among the top disc dogs on the planet, Wallace has become an inspiration for countless pit bull families as he educates the public about pit bull type dogs. Every competition, whether they win or not, is another chance to show the world what dogs like Wallace are capable of achieving when they’re set up to succeed. Now that’s a true Champion! 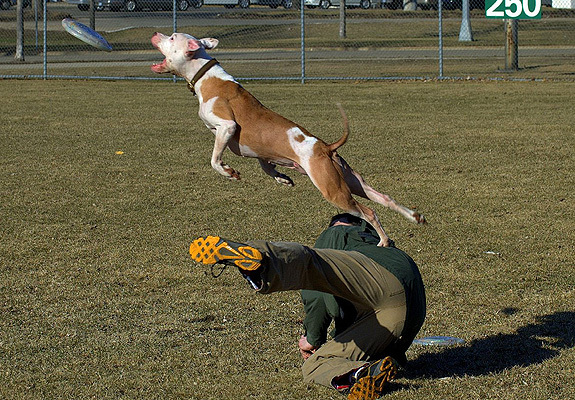 Wallace is changing minds about pit bulls, one disc at a time. Wallace, the Rise of an Underdog, a documentary about Wallace’s life, is coming out soon, for more about this and other Wallace happenings check out his website and Facebook page. I have had the pleasure of working with Roo and have met Wallace and Hector. Great dogs, great family, and certainly they are giving so much back to our community! Love the pics. Wallace! You are awesome, and yeah for The Yori’s for seeing your true beauty. @woofslc Thanks for your comments, they are wonderful ambassadors! @3dcaligirl Thank you for your comments, Wallace and the Yoris are awesome! @AmyMills thanks Amy! Wallace is too cool for school – I’m a big fan!